VMware announced this week the launch of several new products in the growing portfolio of End-User Computing (EUC) solutions, under the VMware Horizon family of products. The expansion of EUC products across the industry is being fueled by increasing demands for IT solutions for business users to be delivered ‘as-a-service’, as well as by the growing trend of Bring Your Own Device (BYOD). The ability of technology departments to deliver applications, user data, and desktop as a service, while maintaining user mobility and freedom must be balanced against the need to standardize and secure delivery of corporate information assets. That’s just what these new releases aim for. First up is VMware Horizon View 5.2. View has been a VMware offering for some time, and is now falling under the Horizon name. View is VMware’s Virtual Desktop Infrastructure (VDI) solution. View provides centralized execution of Windows desktops running on VMware vSphere in the datacenter. With View, IT can deliver desktop as a service by leveraging View’s ability to rapidly deploy standardized desktops to business users. New in View 5.2 is support for Windows 8 desktops, hardware accelerated 3D graphics to support applications like AutoCAD, RevIt, and Microstation, greater scalability by allowing clusters of up to 32 ESXi hosts using VMFS, PCoIP enhancements, and clientless HTML5 access to View desktops. In addition, View 5.2 desktops can now take advantage of the new vSphere 5.1 Space Efficient (SE) Sparse disk format to reclaim whitespace within user desktops for greater efficiency. Many other small features were added to View 5.2, including an improved administration console, syslog support, multi-touch gesture-based control of View desktops for touch-based devices, and faster provisioning of desktops through View Composer. While virtual desktops can be a great solution for many types of users, it is not a perfect fit for frequently offline mobile users, power users who require a great deal of freedom in customizing their PC experience, or where legacy hardware or software demands a traditional PC. 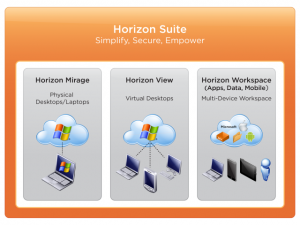 To help address these use cases, VMware has announced the launch of Horizon Mirage 4.0. Mirage is an endpoint centralization and layering solution aimed at providing greater flexibility and manageability of corporate PC’s. Centralization capabilities allow the endpoint state, including OS, departmental applications, user-installed apps, and user data to be maintained in a central repository, providing near-CDP of the entire endpoint. Layering breaks out the elements of a desktop state, from what has traditionally been either a monolithic image or an unmanaged endpoint, into individually managed layers including OS, driver, departmental application, user applications, and user data. Each layer is centralized and easily updated, replaced, or migrated in real-time with little to no user impact. With layering and centralization combined, some very interesting use cases emerge beyond simple management and patching. For example, total endpoint centralization provides the ability to move a user’s entire endpoint state from a traditional PC to a VMware Horizon View based desktop by simply changing the driver layer from the physical endpoint to a VM Hardware set of drivers. By managing the operating system layer, we can swap out the OS while leaving applications and user data intact. This allows seamless migrations from an older operating system such as Windows XP to a newer OS like Windows 7. By layering and centralizing the user data layer, IT can backup and allow user restoration of user data on dispersed endpoints. Horizon View and Mirage are in many ways about giving IT more control of endpoints, while simplifying administration and improving quality of service to our users. But with the commercialization of IT, users are demanding self-service, anywhere/anytime/any-device access to enterprise apps and their data. Horizon Application Manager, allowing IT to create an enterprise ‘app store’ where users can provision, on-demand, any application to which they are entitled. These apps can be legacy Windows applications that have been packaged with VMware ThinApp, SaaS applications where Horizon can pass single sign-on (SSO) credentials from your Active Directory to the cloud-based application, and mobile device apps for Android and Apple phones and tablets. Personal file storage via Horizon Data, providing a centralized, easily accessible personal file storage. 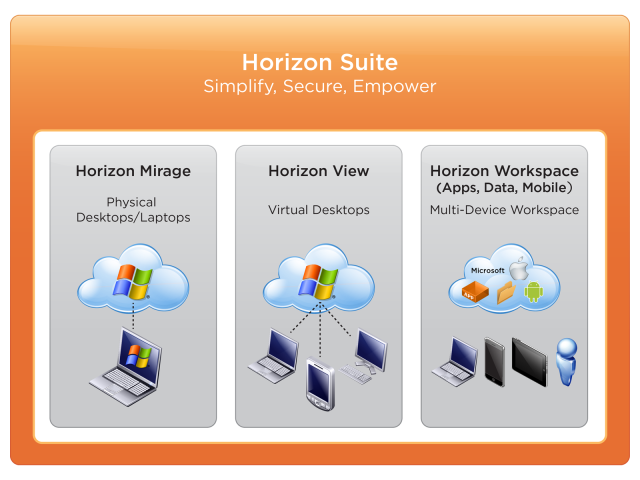 The Horizon Workspace mobile app (for Android or Apple), PC-based Horizon agent, and rich web interface provide easy access to all data users have stored in Horizon, with the ability to preview and share files and folders with any user – internal or external – with IT controlled policies and class of service rules. Desktop as an app, presenting View-based Windows desktops to users, accessible through native HTML5. With desktop as an app, users can connect to a Windows PC to use legacy applications, then return to a personal device to continue their work in other applications presented through Horizon. These are just a sampling of the capabilities across the products in the VMware Horizon launch. With VMware Horizon, IT can re-imagine and reinvigorate endpoint management to deliver cutting-edge services and flexibility to our user base while maintaining control and security of corporate assets. Clearpath has been running beta versions of these products in our lab – we’re happy to provide demos of the VMware Horizon Suite of products or to help you plan how to best leverage View, Mirage and Workspace in your environment.